More than anything, I crave adventure. But in the disease ridden land of Verald, life is mapped out much like the well-established rings of our kingdom. I’m 50/50 on this one. It was quick, easy read that kept me entertained and engaged, but much of it fell short in the plot and character building department. It was also quite predictable. Let’s hit the pros first: the plot moved quickly, which made it difficult to put the book down. There was never a good lull to power down my Kindle and go to bed. I appreciated the lack of instalove, and instead, a slow burning romance that kept my interest. However, the main character, Ryn, was young and impulsive. If I didn’t know her age in the book, I’d have guessed she was 14 or 15. At times, she was so impulsive and stupid; literally, if any other character in the book had pulled the stunts she did, they’d have been killed. She also faced a lot of tragedy and hardship, but didn’t seem to grow from it. Overall, the book was enjoyable and addicting to read. If you enjoy young adult fantasy, definitely give it a shot. I rated the book 3/5 on Goodreads. Apparently, I read the first book back in May 2015. I don’t remember reading it. I ordered a sample on Amazon and seriously, did not remember a damn thing. So I purchased the book, read it, and still didn’t remember anything. Usually when I’ve read a book already and reread it, I at least have a spark or a vague idea. Nope. Anyway, I enjoyed it much more the second time around, if my current review vs. my old one is anything to go by. I enjoyed the character building, and really didn’t mind Feyre. The book is reminiscent of Beauty and the Beast, with a few darker elements woven in. Now, this is a review of the series. I also read Court of Mist and Fury (#2) and Court of Wings and Ruin (#3). Rather than write standalone reviews for them, I’m going to review the entire series here. I devoured the first book. I sped through the second book. But the third book? I’m a little sick of it, and I’m drudging through it. The primary element that kept me reading was the romance. Maas is fantastic at it and the tension in book one and two kept me interested. Once the tension petered out, I lost interest in book three. According to Goodreads, there are three more books slated to be published — I’ll be honest, I probably won’t read them. They were easy reads. I enjoyed them. I was hooked and had a hard time putting them down, most of the time. If you enjoyed the Throne of Glass series, give these a shot. Maas is a great writer and does a fantastic job at weaving a story, constructing a magical world and building her characters. However, I’m ready for a new Maas series — I’m burnt out on this one. This book was beautifully written — I couldn’t put it down. I’m a sucker for a fairytale retelling and this one was one of the best I’ve read. Yeva is beautiful — almost obnoxiously so, as the book kept referring to it (my only qualm with the story). Yeva doesn’t want to settle down and get married — she wants to spend her days outdoors, hunting like her father. When her father goes crazy hunting for a creature in the woods, Yeva decides to track the creature as well. I enjoyed Yeva’s character. She was deep, I could connect with her, and I truly cared about her. I also like the Beast’s character — though the “plot twist” was super obvious, I enjoyed his story and how he came to be. The world was constructed well — I could picture the castle, the woods, the dogs, everything. I enjoyed the magical elements and how the parallel magical world played into the “real” world. I can’t say too much more without giving it away — if you enjoy fairytale retellings, definitely give this one a shot. I rated it a 5/5 on Goodreads and added it to my favorites shelf. 1. 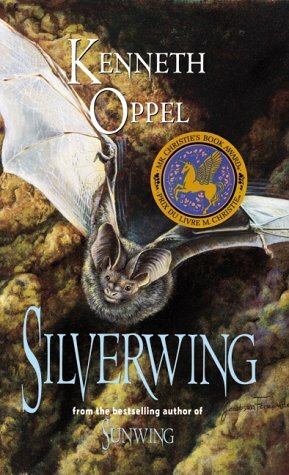 My co-worker’s daughter is currently reading the Silverwing series by Kenneth Oppel, which really makes me want to reread it. It’s basically about a bunch of bats. Basically Shade, a bat, gets separated from his flock during winter migration and has a huge adventure. I was very into animal point-of-view books as a kid! 2. Good in Bed by Jennifer Wiener. I absolutely loved Good in Bed when I first read it—in fact, it was through Good in Bed that I discovered that I liked women’s fiction. 3. Which also makes me want to reread Something Borrowed by Emily Giffin. 4. I think it would be interesting to read The Golden Compass (His Dark Materials series) by Philip Pullman at this age versus the age I was when I initially read it. Knowing the parallels behind the story now would make me read it in a different light. 5. Ella Enchanted by Gail Carson Levine was one of my all-time favorites as a young girl, so it would be fun to reread it again. I haven’t read it since the movie came out, but I remember being furious that nothing matched the book. 6. 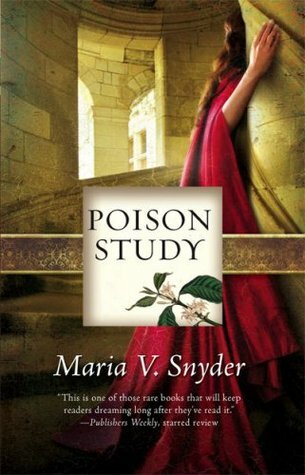 Poison Study by Maria V. Snyder. I just finished it (a review will be up soon!!) and am SO in love. If I didn’t have a million other books I wanted to read, I would probably read it over and over until it was memorized. 7. The Harry Potter series. I keep trying to reread them starting from the beginning, but I get distracted by shiny, new books and stop. 8. Moloka’i by Alan Brennert. This book gave me all the feels when I read it in high school. 9. The Hunger Games series. I’ve forgotten so many of the details from these and they’re among my (very long list of) favorites. 10. Daughter of Smoke & Bone by Laini Taylor. Out of this list, I think this is the one I will actually reread. I loved it and wanted to continue the series, but it’s been so long since I first read it that I’d have to reread it in order to understand the next books. Top Ten Tuesday is a weekly feature hosted by the Broke & the Bookish. Check out more Top Ten features on their site.